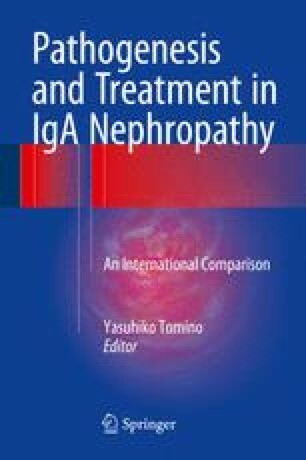 The VALIGA – Validation Study of the Oxford Classification of IgA Nephropathy (IgAN) – was aimed at investigating in a large cohort of European patients with various clinical presentations the prognostic value of the pathology features indicated by the Oxford classification (MEST score). In the 1,147 patients enrolled, the value of MEST to predict the renal function decline was validated, except for the endocapillary lesions, which showed prognostic value only in early stages of IgAN with mild proteinuria. In the VALIGA cohort, most of the patients (86 %) received renin-angiotensin system (RAS) blockade, and half of them had also immunosuppressive regimens (mostly oral or pulse corticosteroids (CSs), seldom associated with other immunosuppressants including azathioprine, cyclophosphamide, and mycophenolate mofetil). The benefit on renal function decline of CS regimen in 523 patients was observed to be significant in comparison to the 624 cases who did not receive it. In Europe the frequency of IgAN and the rate of progression to end-stage renal failure greatly differ in various countries. Among the factors which may be responsible for this variability, including genetic conditioning and environmental influences, differences in treatment approaches could be taken into account. From the VALIGA cohort, we observed that CS treatment, mostly associated with RAS inhibition, was frequently adopted in Southern Europe, while Northern Europe tended to use RAS blockade alone. A difference in clinical outcome of patients with IgAN was observed between these two geographical European areas suggesting a role of different treatment regimens. VALIGA Study of the ERA-EDTA Immunonephrology Working Group: VALIGA Steering Committee, nephrologists, and pathologist collaborators are listed in Appendix. The study was granted by the first research call of the European Renal Association-European Dialysis and Transplant Association (ERA-EDTA) in 2009.